The running scene in Dallas has been improving. As a spread out, quite car-oriented city, running takes some planning. 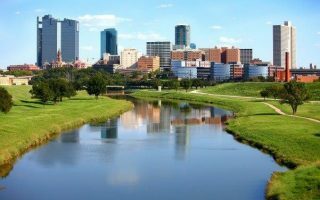 Our guide to running in Dallas includes some great routes downtown Dallas, Fort Worth, and cities popular with business travelers such as Plano, Richardson, and Irving. 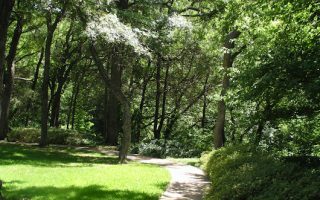 Plano/Richardson Area: Arbor Hills Nature Preserve, Duck Creek Greenbelt (Garland). Fort Worth. 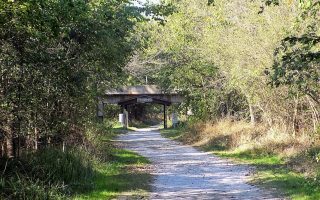 Extensive series of trails called the Trinity Trail System. South of Dallas: Trinity Forest Trail at Lemmon Lake is a good running spot. There are two things to be careful about when running in Dallas. One is the heat — temperatures in May through September can regularly top 100 degrees, so you will have to run early or late in the day. 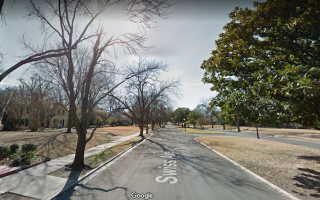 Also, many secondary roads don’t have sidewalks — so best to use this guide and do so research before heading to Dallas. Dallas’ public transport, the DART, has a a steadily improving light rail and bus system. Also, a neat bike sharing system allows you to pick up and drop off just about anywhere. The best bet for running in downtown Dallas. 3.5-mile elevated urban trail, between the American Airlines Center downtown and SMU. Pleasantly shaded in spots, good views, few street crossings. Lit at night! Can do return loop via Turtle Creek Trail. Parallels the Katy Trail, but more park-like. Follow Turtle Creek Blvd. and Lakeside Dr., combination of paths and sidewalk. 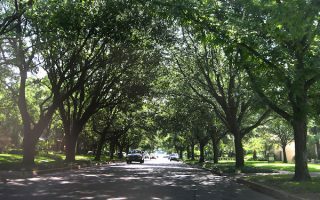 Can also meander around the beautiful streets of Highland Park, featuring gorgeous homes and older trees. Wonderful running in the one of Dallas' prettiest neighborhoods, with gracious, winding roads, estate homes, and older trees. A great 'holiday lights' run! Combine with pleasant running through the campus of SMU, just to the north. 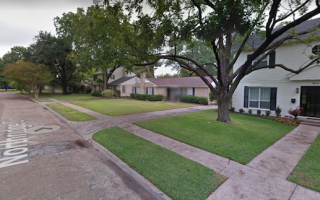 A wonderful run through three historic Dallas neighborhoods: the Deep Ellum entertainment district, tree-lined Swiss Ave., with its gracious homes well set back, and the Munger Place Historic District, another beautiful residential area. The best option from Dallas’ east end. 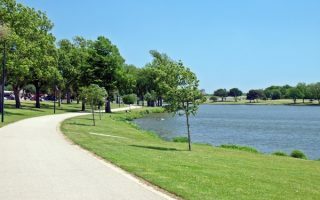 It’s a 4.5 mile paved trail that connects multiple parks in the east part of Dallas, and runs out to popular White Rock Lake. The ‘destination’ run in the Dallas area. The perimeter trail follows about 9.6 miles around the 1,200 acre reservoir. Plus many other trail options. Lovely neighborhood for running just to the west of White Rock Lake. Design your own route along these winding, hilly roads, which feature gracious homes and a nice canopy. Can be combined with White Rock Lake Trail. Extensive series of trails in the Trinity River channel, steps from downtown. Trinity Strand Trail is 2.5, urban trail; Trinity Skyline Trail, is 4.6 mile below grade trail in the riverbed, with great skyline views, but exposed. 7+ miles possible in watershed & along levee. 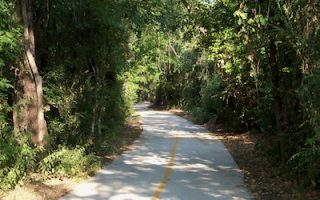 A terrific and expanding paved trail system south of downtown, along Lemmon Lake to the Trinity River Audubon Center. Some sections wooded, other sections with good skyline views. Full loop is 6.4 miles, or do some sections. A flat, 3.1 mile perimeter run around a freshwater lake. In the northwest section of Dallas, next to Love Field Airport. 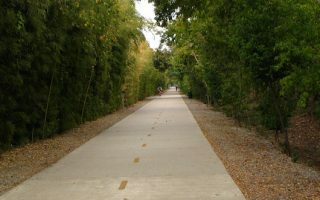 Paved path, other good facilities in park. Good views of the water. Quite open -- use caution on hot days. Your best bet in the Grapevine area and near DFW Airport is 8,000 acre Grapevine Lake. There are numerous running options here, including 9 miles along the lake. 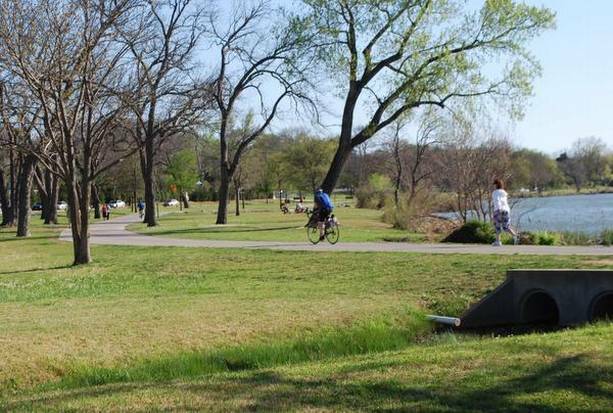 The best bet in Fort Worth is the extensive Trinity Trails system. 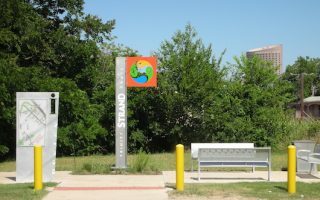 Over 40 miles of trails along the Trinity River and its tributaries, connects 21 parks, downtown, and numerous sites. Richardson is 15 miles north of downtown and near the I-635 beltway. Home to many corporate offices. Plano is 5 miles further north. Here's our guide to some of the best places for running in this area. Dallas weather is very hot in the summer. 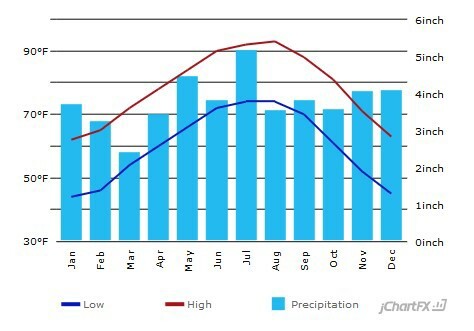 You’ll have to plan your runs accordingly from June through September. Spring and fall there is gorgeous and fantastic for running. During winter, temperatures rarely fall below season, so it’s good for outdoor sports. It can rain during any season and they do get lots of thunderstorms. They can also have long periods of dry weather. Dallas is very spread out. 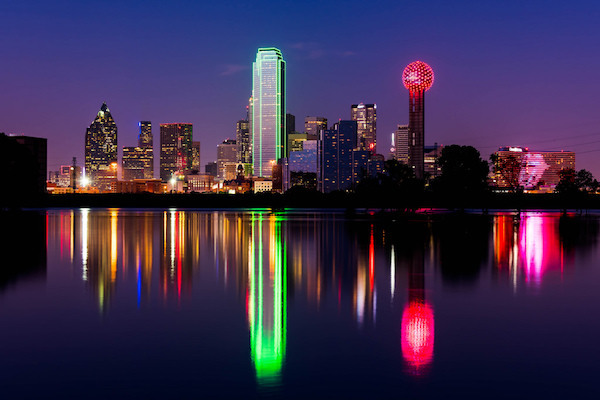 It’s important to plan where you stay, in order to be neat a pleasant place to run in Dallas. The map here shows the cluster of hotels downtown that are accessible to four the Katy Trail, Turtle Creek, the Santa Fe Trail, and the Trinity greenbelt. 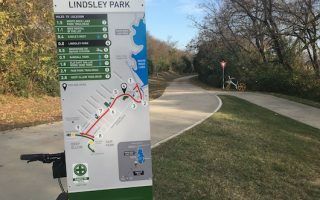 There are hotels at the intersection of I-635 and I-75 that provide access to the North Dallas greenbelt that’s a continuation of the White Rock Lake trail system. If you want to be near Grapevine Lake, go north on Rt. 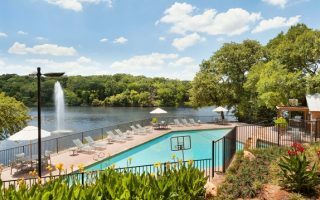 121 from the DFW Airport and you can get within a mile or so of Grapevine Lake. 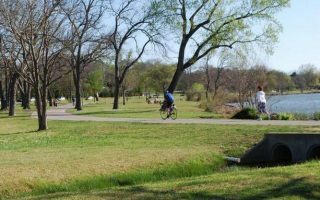 There are lots of hotels in or near downtown Fort Worth that provide good access to the Trinity trails. There are no hotels in exact proximity but there is a cluster of hotels along Rt. 30 about 2.5 miles south of the park entrance. Interestingly, there are no real running stores in the heart of downtown Dallas. But here are some running stores in particular parts of the city. Here’s a link to the Dallas Running Store map. Zoom in on your area to find a running store near you. Look for the following independent, runner-focused stores. RunOn Texas is a small chain of Dallas area running stores, with locations in northeast Dallas, Southlake, Preston, and other locations. Extensive training programs, great race calendar, regular group runs. Luke’s Locker is another group of running stores with multiple locations in the Dallas area. Extensive training programs. New Balance has stores in the Dallas, Fort Worth, Arlington, Rockwall, and Southlake. LINK HERE. RunOn and Luke’s Locker locations. Rockwall Running Center. On the White Rock Lake trail. Relatively new store. Run On and Luke’s Locker Locations. Luke’s Locker runs extensive sponsored training programs. Group Runs. Since Dallas is so spread out, I suggest you go to the RunOn or Luke’s Locker locations in a particular area. White Rock Lake. RunOn hosts free group runs Wednesday evening. Pano Placers. For North of Dallas. Tons of regular group runs and events. Dallas Running Club. Dallas’ oldest and largest running club. YMCA Turkey Trot. Attracts more than 30,000 runners. 8 mile and 5k.